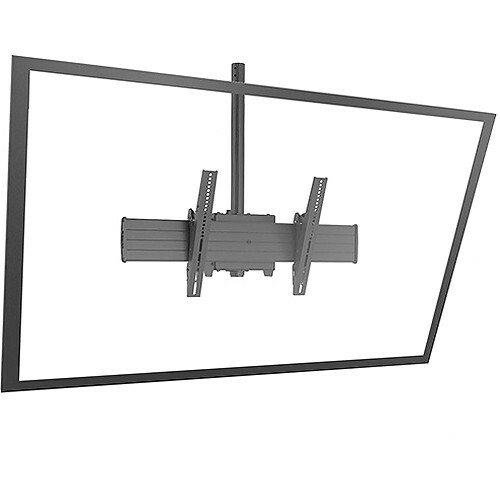 Mount your 60 to 90" display to the ceiling with the black Chief FUSION XCM1U Single Pole Flat Panel Ceiling Mount. It supports displays weighing up to 250 lb with 200 x 100 to 800 x 400mm mounting patterns. The mount will attach to separately sold traditional 1.5" NPT and select Chief CPA pinned ceiling plates and column systems. It provides -20 to 5° of tilt so you can achieve your preferred viewing angle. Box Dimensions (LxWxH) 36.0 x 14.5 x 10.0"
I need a short drop pole, as my clearance is very limited over my stone fireplace from the ceiling, above the mantel piece &amp;between ceiling? Pipes are available in many lengths, fixed and adjustable. Here's a smaller one: &lt;a href= http://www.bhphotovideo.com/c/product/682548-REG/Peerless_Industries_AEC0609_6_9_Adjustable_Extension_Column.html target= _blank &gt;http://www.bhphotovideo.com/c/product/682548-REG/Peerless_Industries_AEC0609_6_9_Adjustable_Extension_Column.html&lt;/a&gt;There's an appropriate length available for your particular need.Please be advised you'll also need a ceiling plate.